NEON Personnel Tracker was used to track law enforcement, emergency management technicians and other first responders during the DHS supported exercise. 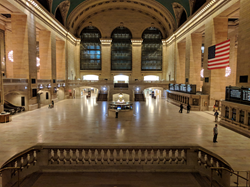 TRX System's NEON® Personnel Tracker solution was used to provide 3D tracking of first responders during a New York City emergency responder critical incident training exercise last week at Grand Central Terminal. The New York Police Department (NYPD), Metropolitan Transportation Authority Police Department (MTA-PD), New York State Police, National Guard and Fire Department of New York (FDNY) participated in this large scale incident response exercise. NEON Personnel Tracker was one of several new technologies selected by the Department of Homeland Security (DHS) Science and Technology Directorate (S&T) to be tested for the ability to improve first responders’ preparedness and response to a major incident within a large public facility. NEON Personnel Tracker delivers 3D tracking and visualization inside critical infrastructure and dense urban areas, including within large public transport structures, within stadiums and underground. By delivering real-time personnel tracking in these GPS-denied environments, NEON improves situational awareness, command effectiveness and safety for first responders. TRX participated in last week's test to evaluate the NEON system's impact in support of a large critical incident response. More information about the exercise can be found here. TRX Systems is the developer of the NEON® Indoor Location Solution, delivering location and mapping indoors, underground and in dense urban areas where GPS is not available or is unreliable. NEON delivers ubiquitous, low-cost, 3D indoor location through the use of advanced sensor fusion, ranging, and patented dynamic mapping algorithms. NEON patented location technology provides the foundation for a number of commercial applications including NEON Personnel Tracker, NEON Signal Mapper and NEON Squad Tracker. TRX Systems is the recipient of the Silver Edison Award for Innovation in the Navigation and Robotics category, the Tibbetts Award given by the U.S. Small Business Administration for Innovation and Economic Impact of Research and Development, the TEDCO ICE Award for Corporate Excellence, and the Innovator Award from the Chesapeake Regional Tech Counsel (CRTC). TRX's indoor location software development has been supported by the National Science Foundation, the Defense Advanced Research Projects Agency (DARPA), the U.S. Army, and the Department of Homeland Security. For more information, visit http://www.trxsystems.com.